Catholic homeschool curriculum can make teaching school at home so much easier! 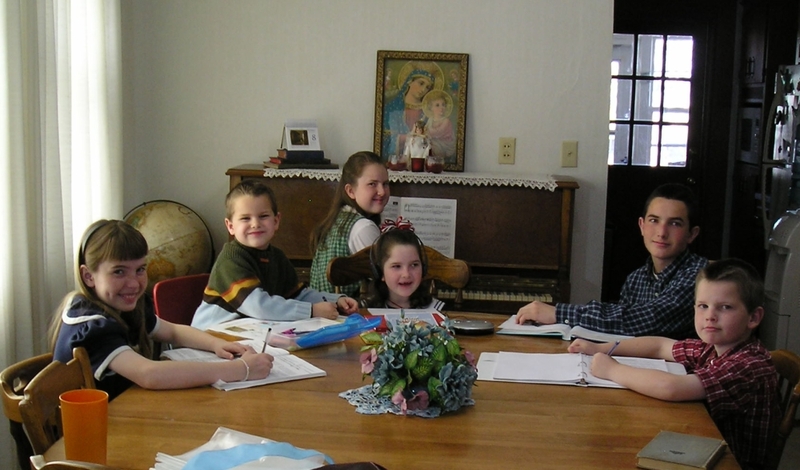 We are SO grateful for the many Catholic homeschool curriculum programs there are today. There are so many lesson plan shortcuts and improvements that did not exist at the turn of the century (2000). It is so much easier to teach children the Roman Catholic beliefs at home than it ever used to be. When we started homeschooling we looked for the resources that taught the Baltimore Catechism and used the Douay-Rheims Bible. You'll find that they're so easy to trust. They are the kind of Roman Catholic books that teach the Faith as it has lasted for 2000 years. It is nice to have a real opinion of the different curriculum available from someone who's used it, then you can learn easier ways to teach and plan your lessons. The most important thing is to find good books. At first it's great to have a curriculum all set out. These companies can do this for you. And assign that many pages per school day. These next Catholic homeschool curriculum providers use the Baltimore Catechism to teach the Catholic beliefs and Catholic prayers. You can see that it's a bit of a litmus test for Catholic curriculum. We've used curriculum from each of these providers and think that you'll find some real treasures. There are more and more resources for Catholic homeschooling through these last years, so it is a God-send to have help teaching the basic Catholic beliefs. Many of these resources were not available till the late 1980s, so you can extend your gratitude to the good souls who have developed these Catholic homeschool programs. They've made it so that you can have at hand a "homeschool curriculum in a box" or the ability to "pick and choose" the Catholic books you see fit for your family with the plans that you make. Several are accredited homeschool programs, they can all be flexible. PrintNPractice, our sister site for K-6 has thousands of free printable worksheets for your children to practice the basic Math, Phonics, Grammar, Handwriting, and Spelling skills. You can also buy them in bundles so you do not have to be online to use them. I recommend keeping an eye open for better books. Through the years the different companies have improved their homeschool curriculum with re-writes or new editions of some books. Saxon Math is one instance where its homeschool version is a huge improvement over the old books. I also recommend using an all in one phonics, handwriting, spelling program like Spalding/Orton or Wanda Sanseri's program. They make sense with no confusing elements or fluffy time wasters. See my explanation of Spalding at #4 here. I also really like using real books where possible. Sometimes textbooks get in the way of real learning either with bad content or bad method. The beauty of homeschooling is that you're free to use what works for your family. Math, language arts and a good catechism and saints stories can be most of what you need for the first three or four years' school work. Mrs. Laura Berquist has very good homeschool ideas in her Designing Your Own Classical Curriculum (Amazon). One of my favorite is not to have to feel like you need a grade for a subject. The idea is to get it right and work till you do to the best of your student's ability. Fill in with coloring, history, and science as you go. There are very good curriculum choices at these next homeschool companies, too. Our Lady of Victory also has an excellent Catholic homeschool curriculum and is noted for using the old Baltimore Catechism. You'll find many traditional Catholic books here and you'll love their new high school history and literature programs. For several years I used their Living My Religion series (LMR) as readers. This sets a standard for the children's reading level and reviews the catechism at the same time. I love being able to double-up when I can. Our Spelling worksheets at PrintNPractice use the LMR word lists. I also like the Little Angel Readers. They have lovely stories and teach phonics in a fun and simple way that agrees with much that Dr. Orton taught. I really like their Douay-Rheims Bible, El Cid, St. Fernando III, Defenders of Christendom, and other Catholic books at their printing shop: Lepanto Press. They also sell many other books that might be useful to you, especially classics from Memoria Press as well as a series of Brother Earnest books. Seton Home Study School has an excellent Catholic homeschool curriculum and has totally rewritten many old Catholic textbooks into a more homeschool user-friendly format.... I think you'll really like their Grammar and Writing books. My favorites are some of their history books and their states and countries handwriting books. Mother of Divine Grace School "Mother of Divine Grace's home school curriculum is a particular application of Laura Berquist's recommendations in her book Designing Your Own Classical Curriculum...."
Catholic Heritage Curricula Here is their description: "Catholic Heritage Curricula publishes colorful and current texts for Catholic homeschooling families. CHC offers lesson plans, free curriculum, ...."
Catholicity has a variety of services that can be a great service to Catholic homeschoolers like the Catholic Encyclopedia (1914). See their "Best Catholic Links" an "Exclusive database hundreds of carefully screened links". Homeschool Connections Online has helpful online homeschool curriculum, too, especially with Math and languages. ColorWithFuzzy, one of our other sites, has modest coloring pages with happy, seasonal, and preschool themes. Disclaimer - Of course we are not able to research, and therefore endorse, every item from every one of these Catholic homeschool companies; yet we can endorse that each of them have many of our favorite resources. You can also trust that the people who run these Catholic homeschool companies intend to teach the Faith well. You will have to make your own comparisons to Catholic principles, yet rest confident you have a great start with these Catholic homeschool curriculum companies.